Great news, everyone! 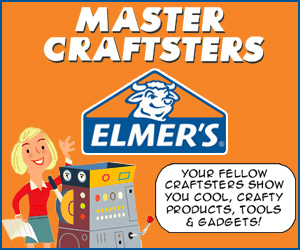 I was chosen a while back to do some sponsored projects in Craftster.org's Master Craftster Series for Elmer's and X-ACTO :) Five other magnificent crafty ladies and I were sent a heaping box full of awesome tools and supplies and were asked to craft away with the items. It was a blast. I've been sitting on a ton of projects for a while, as I had to keep them hush hush until the campaign was revealed. But now the cat is out of the bag and I get to share my projects and tutorials over the next few days. Boo-ya. It was so fun to get to share this fun experience with you, Kira! Everything you created was so fun and bright and happy and original! Like everything you do :).